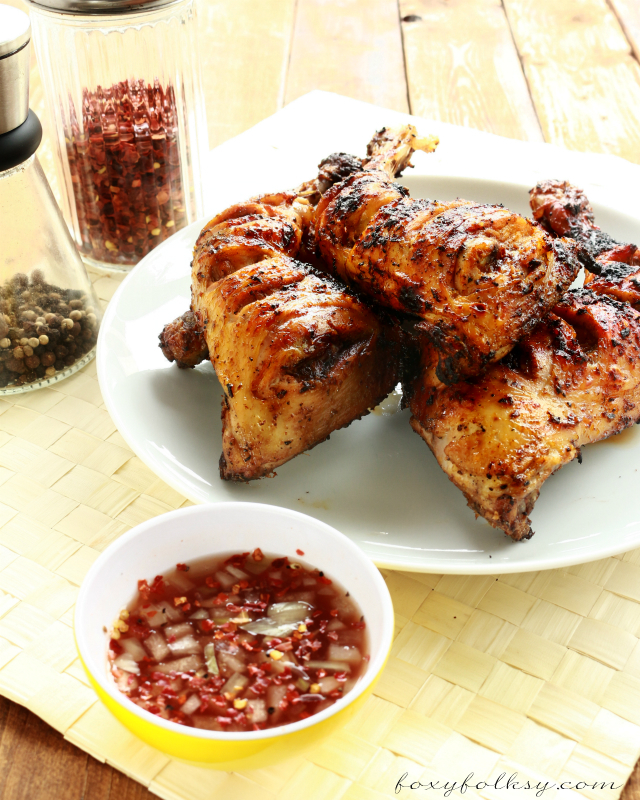 Chicken Inasal or simply Inasal, which is the dialect for grilled or barbecue is a popular dish in the Philippines that originated from the City of Bacolod. 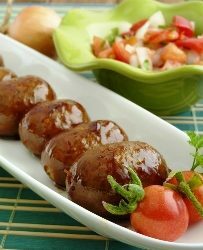 It is different from the usual chicken barbecue from the country because it is marinated in vinegar, kalamansi juice and other spices like lemongrass and ginger. The color is also quite unique: orange because it uses a special basting sauce that is with annatto/achuete oil. It is usually served on bamboo skewers direct from the grill with rice and a dip of spiced vinegar. So if you are tired of the old and usual chicken barbecue, this is the one to try. You will find that the taste is uniquely refreshing and very flavorful. 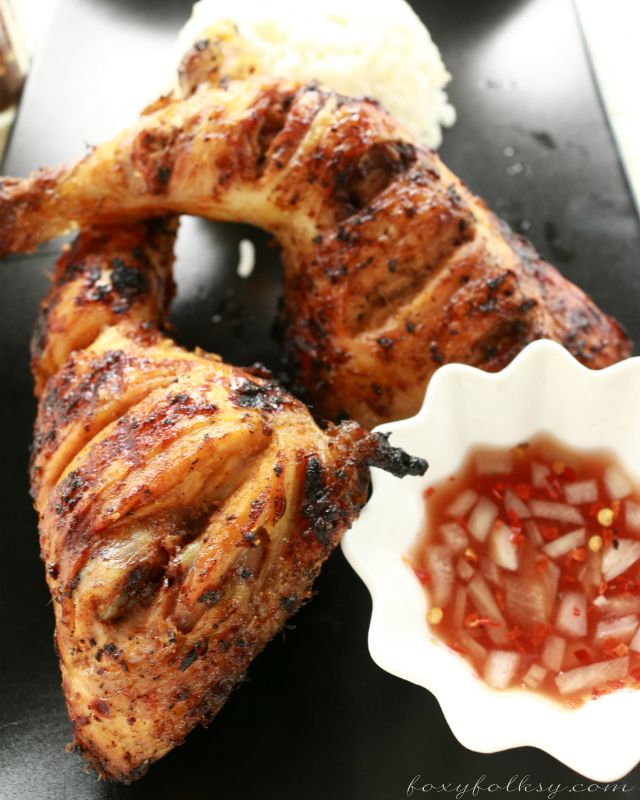 Chicken Inasal became so popular among Filipinos that a lot of restaurants or grills specializing in this particular dish emerge all over Metro Manila and surrounding provinces. How bad that its popularity hasn’t reached Germany (yet?!) which means I had to do it on my own. Oh well, I think that is the life of an immigrant (craving for home food). 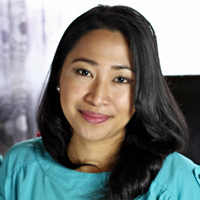 I have to admit, I learned so much more about Filipino cooking and recipes when I came here in Germany. I know a lot of dishes but usually, I just ordered them from the menu and not think so much how they are prepared. Don’t get me wrong, I am not complaining…at all! The first time I made this, it was an instant hit and Armin is now a fan and just last week I was asked to help organize food prep for our company grill party next month and I am thinking of giving them some sample of Filipino cuisine and this is will be my frontrunner along with some Filipino desserts, Leche Flan and Maja Blanca. So wish me luck! Tired of the old and usual chicken barbecue? 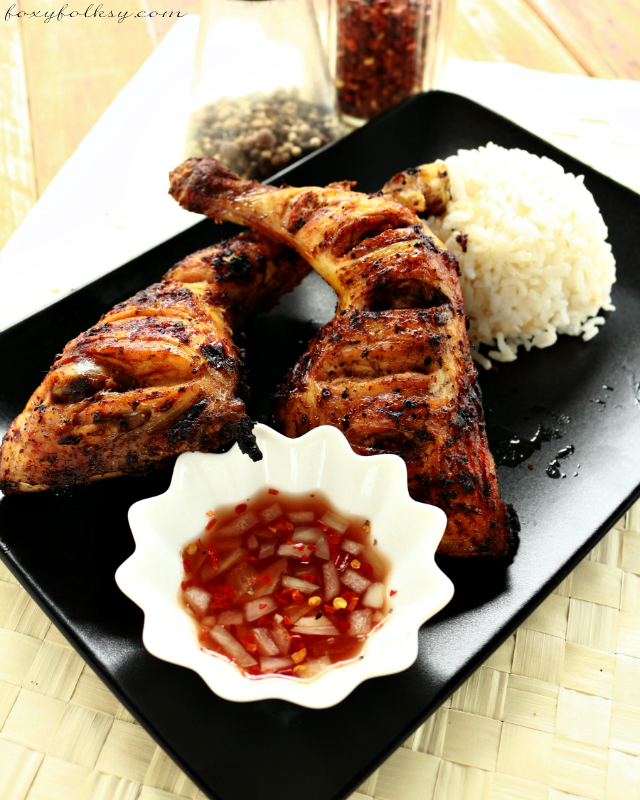 Try Filipino Chicken Inasal, marinated in vinegar and other spices, is uniquely refreshing and very flavorful. Dissolve sugar and salt in vinegar. Combine vinegar and all other ingredients for the marinade in a blender and pulse for 2-3 minutes until all are cut into tiny pieces. Place chicken pieces in a ziplock or any food-grade plastic. Pour in the marinade into the plastic with the chicken and seal. Refrigerate for at least an hour but overnight will be better. Take out from the fridge when ready to cook. Prepare the basting sauce by simple combining all the ingredients in a bowl. Grill the chicken pieces for about 20 minutes or until well done while basting both sides with the annatto oil. Heat oil and annatto seeds in a saucepan over medium heat. When it starts to bubble around the seeds, remove from heat. DO NOT overcook or they will get bitter. Let cool down to room temperature. Separate the seeds from oil using a strainer. If annato seeds are also not available, mix some Paprika and turmeric powder in oil as a substitute to achieve that orange-yellow hue. Thank you for posting this yummy yet simple chicken dish. I never had Chicken Inasal before. It was a hit last night! My hubby (who is British) loved it very much. Thank you for posting! Bebs how much of the i gredients for the dipping sauce. Hi Roger, I usually mix it without exact measurements but it would be somewhat like this: 1-2 teaspoon soy sauce, 1/3 cup vinegar, 1/2 medium onions, chopped finely and some chili flakes or fresh chili. Thank you my wife is Filipina and i am going to surprise her with this dish for our Valentine’s day dinner. 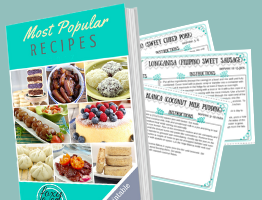 Keep the recipes coming. Hi Roger, I am pretty sure you’ve got some extra brownie points from your wife for the thought and gesture. That is really sweet! ???? What are the ingredients for the dipping sauce. Thank you. I mix together a bit of soy sauce, vinegar, chopped onions and chili flakes. 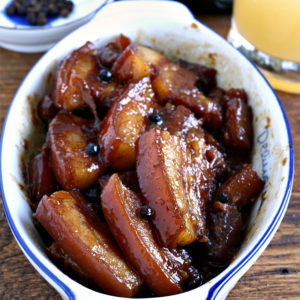 You can also use soy sauce, calamansi juice, and chili. Kabalen, salamat keng blog mu, susubukan kune itang tocino mu, atiu ne king ref to marinate atlung aldo. Ginamit kune mu rin itang empanada dough recipe mu, manyaman ya kanu ana ning misis ku atsaka kapatad. Salamat talaga keng pag share mu keng lutung kapampangan! What a great and simple recipe. I am pretty sure that this will be a much talked about and finger licking good for this coming summer barbecue picnics in my kids school. These events are “pot luck” events wherein the fathers talk about sports and the mothers talk about food. I am the only parent who can talk about Steph Curry and Chicken Curry at the same time. hahahahaha. Again, danke schoen.